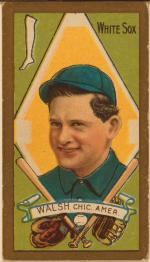 Edward Walsh's baseball card, 1911. It couldn't have been much fun to face White Sox ace Ed Walsh in his prime. He had a solid fastball, and a so-so curve, but neither of those pitches wreaked the havoc of his third. "He threw a spitball," former Tiger great Sam Crawford told an interviewer long after he retired. "I think that ball disintegrated on the way to the plate, and the catcher put it back together again. I swear, when it went past the plate, it was just the spit went by." Given Walsh's numbers, that sounds about right. Once he perfected his spitter, Walsh dominated the American League for seven seasons, posting 40 victories - second best in Major League history among all post-19th century pitchers - 11 of them shutouts, in 1908 alone. The son of an Irish immigrant miner, Edward Augustine Walsh was born in Plains, in the heart of anthracite coal country just northeast of Wilkes-Barre, in 1881, the youngest of thirteen children. As soon as he was old enough, he followed his father into the mines; his strong right arm would be his ticket out. Walsh pitched several seasons for a local semi-pro team before signing his first professional contract, with Wilkes-Barre of the Pennsylvania League, in 1902. His broad shoulders and large frame - 6-foot-1 and 193 pounds - earned him his nickname, Big Ed. His abilities won him a quick promotion to the Connecticut League where he posted a 15-5 record at Meridian. He advanced the next season to the Eastern League, winning 20 games for Newark and the interest of White Sox owner Charlie Comiskey, who purchased the young fastballer's contract for just $750. Walsh would soon be worth a lot more. At spring training in 1904, he roomed with a pitcher who taught him the spitball, then worked hard throughout 1904 and 1905 learning to control the difficult pitch. By 1906, he was its master. The pitch began toward home plate like a fastball, but without any rotation it broke sharply down, as bafflingly as a knuckler. After posting just 14 wins in his first two years with the Sox, he went 17-13 in 1906, threw 10 shutouts, and led the team that came to be known as the "Hitless Wonders" to the World Series. There he added two more victories, one a stingy two-hitter, in the Sox's upset of the heavily favored cross-town rival Chicago Cubs. 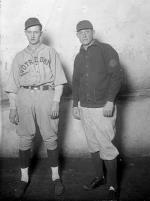 "Big" Ed Walsh and his son, Ed Walsh Jr. at Notre Dame University, 1926. A true workhorse, Walsh also pitched regularly in relief, leading the league in saves five times in that six-year span, as well. And though he put up a dismal 18-20 record in 1910, the numbers are deceiving. He was still backed up by a bunch of hitless wonders. His team hit only six home runs all season, and half of his losses were by shutouts, while he stood atop the league with a measly 1.27 ERA. But all that pitching took its toll. Walsh was essentially finished after 1912, his arm exhausted. He hung on for another five seasons, winning just 13 more games in thirty-three appearances. He left behind a solid overall record of 195-126, with 57 shutouts, and a 1.82 career ERA, the lowest ever posted for a pitcher with more than 1000 innings. After retiring, Walsh remained in baseball as a minor league manager, an American League umpire, and a college coach. In the late 1920s, he returned as a coach with the White Sox for several seasons; one of the pitchers on his staff was his son, Ed. 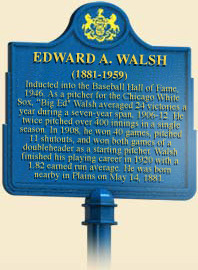 Walsh was inducted into the Hall of Fame in 1946, and died, in Florida, thirteen years later. In 1998, the Sporting News ranked him 82nd on its list of the game's 100 greatest players. Jack Smiles, Big Ed Walsh: The Life and Times of a Spitballing Hall of Famer (Jefferson, N.C.: McFarland & Company), 2007.